Gait correcting, leg strengthening, ambulating therapy clinically proven to not only unload the knee but delay the progression of knee OA. The pneumatic air bladders on the unloading side of the knee joint and on the lateral side of the shin cuff allow for effective adjustable unloading of the OA knee. Improved knee extension during brace wear increases quadriceps firing to significantly increase quad strength over time. 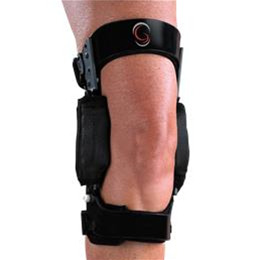 In clinical studies, after 90 days of brace wear, Grade III and IV OA patients had reduced UNBRACED knee pain of 43%, quad strength increased 54%, hamstring strength increased 28%, timed up and go improved by 17%, stair climb was 26% improved, UNBRACED gait was 11% faster, and the UNBRACED forces in the knee joint were reduced by 27%. Rehabilitation of the OA leg after 90 days of OA RehabilitatorÔ brace wear has been clinically demonstrated to be more effective than exercise alone in delaying the progression of knee OA. 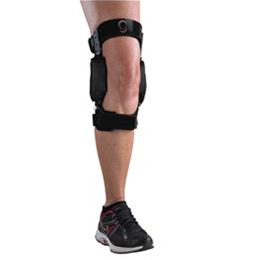 The OA RehabilitatorÔ Knee Brace is prefabricated and is available in varus or valgus configurations. OA patients with mild to moderate varus OA or mild valgus deformities may be fitted with a Sport Rehabilitator which has air bladders on both sides of the knee joint. The unloading air bladder must be inflated first to properly unload the knee. The opposite air bladder is inflated next to increase joint compression and to reduce torque in the knee joint.